We had the privilege to present at the very first Tennis Technology and Analytics Summit organized by the International Tennis Performance Association. Thank you Dr. Mark Kovacs for leading the charge in our field! Please see an introduction below and a link to full documents being first of their kind in the tennis industry. 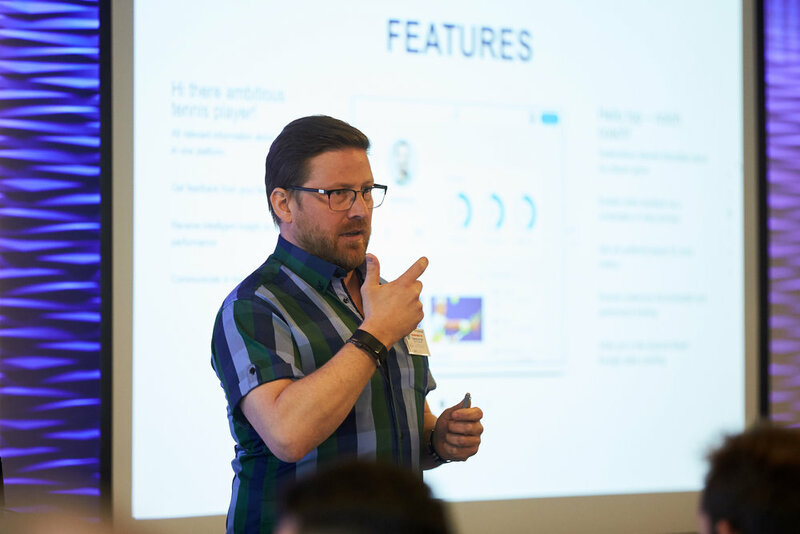 As part of the 2018 World Tennis Fitness Conference, the International Tennis Performance Association hosted a half day Summit on Tennis Technology and Analytics. The purpose behind the Summit was to bring practical experts together to discuss the State of the Tennis Industry and provides some recommendations for the future. The growth of technology and analytics in all sports has grown exponentially in the last decade. The tennis industry has embraced many aspects of technology and analytics, but also has many areas that continue to be developed to improve the sport in all the various areas. many apps is more a matter of extra features, quality and simplicity. Using video analysis is highly useful since we often miss things in just watching. In addition, your student can more clearly see what to work on. You can often ask your students what they think rather than offering a correction. It becomes a better learning experience if they try to figure out some things. Finally, consider videoing at high speeds or slow motion (e.g, 240 fps). It uses more space on the smartphone but it’s easier to see things that you might miss at 30 fps. rectangles, choice of colors, text/fonts, angles (with degrees). Advanced tools may include timer, dotted lines, curves using paths, etc. Wheel or timeline for moving a video forward and backwards in time. Split-screen for side-by-side comparison and synching of two vidoes. When comparing two videos, for best results, make sure the speeds are the same. You can still use different speeds but it’s a bit harder to compare since you may need to manually move one video around. You can use the app or other video apps to speed or slow down videos before adding them into split-screen usage. There are four ways of using split-screens: Before and After lesson: Is a common usage of filming. Keep in mind, your student may or may not have a change in technique. So usually do with dead ball feeds after the technical change. If you film during live points afterwards, you may not see a change. The purpose is the create a good image of what the student can do and is trying to achieve. Film a stroke at the start of the lesson before giving any corrective instruction and film midway or near the end of the lesson. In between, work on the stroke for 10-20 minutes. To save time, rather than analyze on site, you can send results to your student after the lesson. But during the lesson, it’s best to have your student quickly view the videos and after the lesson, spend 15 minutes creating the split screen analysis. is perhaps the most common usage. Upload pro videos on the app or at least your camera. When filming, pick student filming angle views that are the same as you have stored for touring pros. It’s helpful to show briefly the split-screen of the pro and student during the lesson before you proceed with the bulk of the lesson. You can film again at the end and make the final split screen with the after-the-lesson video. Same serve, different angles using two cameras with Hudl Technique. These two apps are basically the same and still relatively new and unknown. Developed by Oivind Sorvald of NTF with Brian Parkkonen at PTR. The Norwegian (NTF) app came out last year and is a bit cooler to look at. Not all the time you get an app logo and home page in another language. NTF Technique is mostly in English and quite simple, since they wanted to sell the app to others outside Norway. Sorvald also works closely with PTR (on the board of directors) so it wasn’t a major issue for Parkkonen to create a PTR version. The main difference besides language is the in-app videos for coaching red, orange, and green ball youth athletes. PTR videos are on hard courts as opposed to NTF videos on clay courts. PTR Coach app showing in-app videos of junior players For moving a video on a timeline, other apps which have a “wheel” with hash or tick marks like a ruler which you slide around. You only see a part of the video timeline so if the video is long, you have to do some extra sliding with the timeline. But in PTR/NTF, there is a simple bar. The bar (with arrows) is an advantage for moving the video from one sport to another very quickly but it’s not easy to precisely line up the videos especially if your video is a bit long. That makes synching two 30 second videos a bit difficult. If you use short videos, like 8 seconds, it’s quite easier with PTR or NTF than other apps. The unique part of PTR/NTF analysis is the comparison for youth tennis athletes. Competency parameters are set for strokes so if you want to compare your student with an ideal orange ball stroke, those images are ready. Given sometimes youth strokes are unrealistically compared with pros, this approach with junior players can be more productive. PTR/NTF apps also allow pdf reports to be generated with frame by frame analysis. You can create player reports with the pdfs. You do not need to be a PTR member to purchase the app. PTR Coach app with player report. any app. So if you go with Hudl, I don’t recommend getting the in-app purchases unless you are related to one of the touring pros. Or a fan. Hudl isn’t much different from other apps but it does have a very smooth feature for changing speeds (1/8, ¼, ½ or full speed) of the video. The final video product does seem quite good in quality. Coach’s Eye is the most popular for ease of use. It can be purchased inexpensively as a complete package. It allows easy access to youtube uploading and GoPro cameras. Because of its simplicity, Coach’s Eye remains the most popular option. Like Hudl and PTR Coach, Coach’s Eye does audio commentary during the video play. One disadvantage of Coach’s Eye seems to be the quality of video when exported. You may lose a fair amount of resolution. In addition, it takes a relatively long time to render a video after editing. The final video product can be mediocre in quality so make sure the original video quality is excellent and also don’t make the video long since that lengthens rendering and loss of video quality. On a personal note, I do use Coach’s Eye the most simply because I have most of my touring pro videos uploaded on the app. So it’s easy for instant side-by-side comparison. Dartfish Express is the scaled-down version of its more complete laptop version. It differs from the other apps in that you have to take a still photo which is a key position (e.g, unit turn) and do the audio commentary over the still. Other apps do the commentary during the video. Typically, you can move the video forward or backwards and make notes. Dartfish Express doesn’t have that option but counts on creating a series of stills or key positions as points of commentary. It’s more a matter of getting used to Dartfish Express. Dartfish Express is less intuitive than the other apps which probably accounts for its lower popularity. Therefore, there is a learning curve that may take some practice but within a few attempts, you should be good to go. Still it scores with high quality final videos for viewing. The final product often looks sharper than Coach’s Eye. As a final word, save your videos by uploading to youtube. You may want to protect the privacy of your student by listing videos private or as unlisted. (I covered recognizable faces in this article). But storing them on youtube privately is helpful since never know when you might need to look at the video again in case you misplace your phone or need more space. Have fun filiming! A big thank you to Doug Eng for contributing to the Tennis Techie blog for the benefit of all forward thinking tennis coaches out there!